Einkorn (triticum monococcum) is the ancient precursor of wheat, the original wheat that grew in the area known as the Fertile Crescent in present-day Iraq and Syria. The grains are not very different from those harvested and eaten about 18,000 years ago and cultivated from about 10,00o BC. Einkorn moved from the Fertile Crescent area all the way to the Italian Alps where it was found in 1991 with the frozen remains of Ötzi the Iceman. They examined his last meal and it contained meat, roots, berries and Einkorn wheat. Even in the UK, grains of Einkorn have been discovered at an underwater archaeological site on the Isle of Wight where it was cultivated around 6,000 BC, when Britain was still connected by land to Europe. Einkorn has an ability to survive on poor soil and in adverse conditions; however, as time went on, other varieties of wheat became more popular due to bigger yield and easier processing. 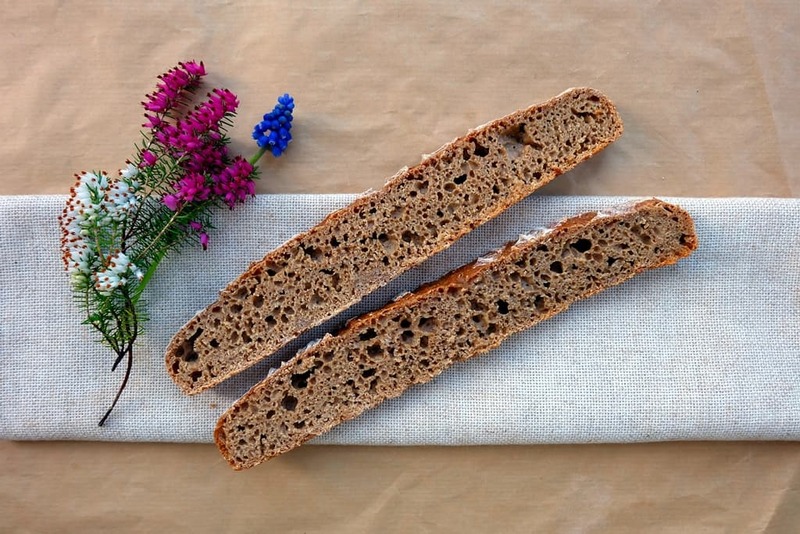 Here is my Einkorn sourdough bread recipe, made with 100% wholemeal Einkorn flour. A beautifully golden loaf, with a deliciously creamy texture. After all of this time, Einkorn has remained a pure wheat that has not been hybridized. It aptly translates into “one grain” in German as it has a single grain attached to its stem, while other modern varieties have groups of four grains. All varieties of wheat we know today are descendants of wild Einkorn. Einkorn is ground into a soft and golden flour. As the gluten is weaker than standard wheat flour gluten, it requires a shorter mixing and kneading cycle than with regular bread flour. The dough can become sticky with excessive kneading and the slightly sticky gluten produces loaves of smaller volume than modern flours. Einkorn flour absorbs less liquid than other wholemeal flours. As a general rule, the hydration amount should be reduced by 15% for standard wholewheat Einkorn flour. Resist the temptation to add more flour to lessen the dough’s sticky texture as it will end up drying up and baking dense later. Try to keep your dough wet and sticky. Finally, don’t let it proof to the same degree as you would with normal wheat doughs. If Einkorn dough rises too much, it will deflate in the oven. Make sure the dough springs back when you press on it with your finger. It is better to under-proof than over-proof with Einkorn. 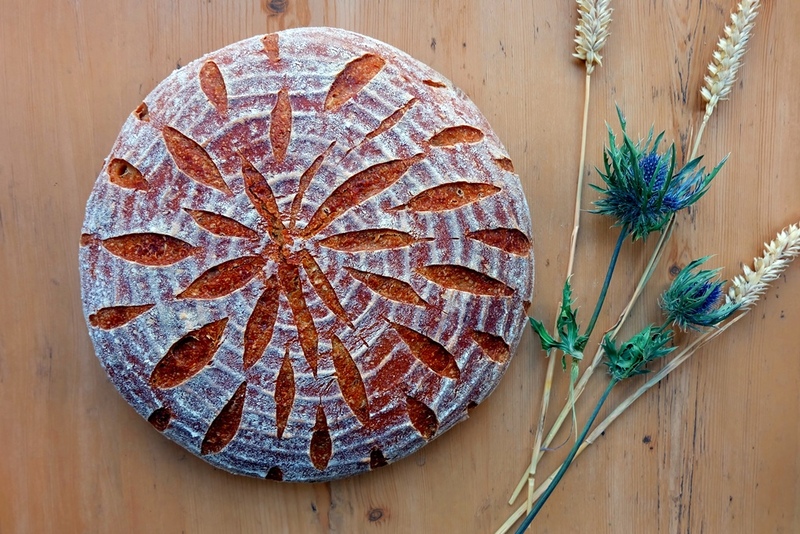 Production today is limited and isolated, yet in the UK, Einkorn flour is available from Doves Farm and Shipton Mill. 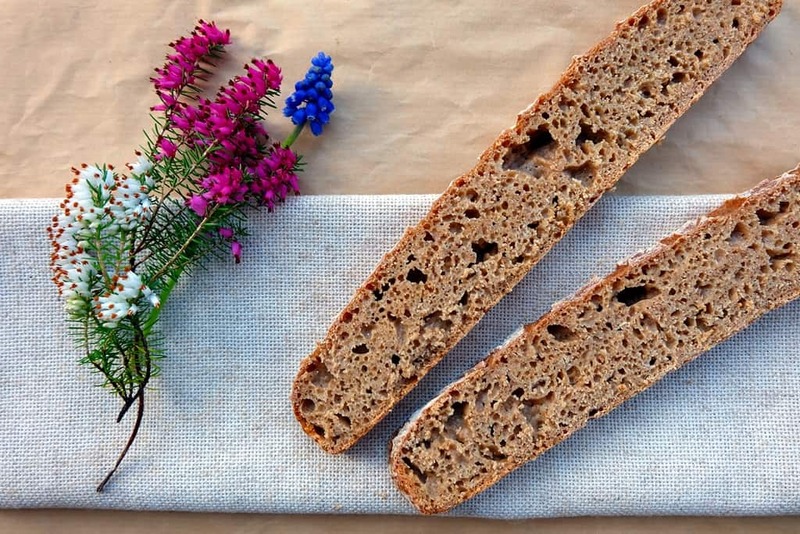 Bake a rustic sourdough bread with golden Einkorn flour. Light and creamy in colour with a rich flavour. Combine the sourdough ingredients in a medium bowl, cover and set aside at room temperature for 12 hours. On the second day, combine all main dough ingredients with 150g of the refreshed sourdough starter (the rest should be set aside for your next bake) in a large bowl. Mix until all ingredients are well combined but avoid kneading the dough. The dough will be sticky, so work with your dough scraper to make things easier. Shape into a ball and place back into the bowl. Cover and leave to rest for about an hour at room temperature. Deflate the dough and shape into a boule, cover with (rice) flour and place into lightly floured proofing basket. Cover with a polythene bag to protect the moisture and proof at room temperature. For me, in my Edinburgh kitchen, this process takes a good 6 or 7 hours. However, if your kitchen is warmer, the process may be much shorter, perhaps only 2 hours or so. Preheat the oven to 220°C and preheat your baking dome or Dutch oven at the same time. Turn out the loaf onto the baking dome or Dutch oven (or otherwise a baking stone or baking tray lined with baking paper). Score the top with a pattern of your choice. Use a scoring knife for best results. Bake at 220°C for 10 minutes and at 200°C for a further 40 minutes. Take off the lid of your baking dome or Dutch oven for the last 10 minutes if using to firm up the crust.